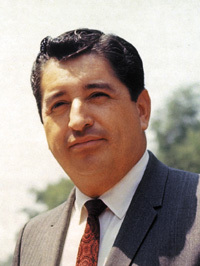 44 years ago, on August 29, 1970, Ruben Salazar was killed by a Los Angeles County sheriff’s deputy during a peace march against the Vietnam War in Los Angeles. His death is the lasting legacy of a pivotal moment in the Chicano-American civil rights movement. The antiwar march, known as the Chicano Moratorium, was nearly 30,000 strong and thus the largest Mexican-American rally to date. Along the way an “incident” sparked chaos giving sheriff’s deputies the pretext to move in with force, rushing the crowd with billy clubs and tear gas. It soon became the biggest and bloodiest riot in L.A. since the Watts riot in 1965. This entry was posted in Activism, Biography, California, civil rights, Essays, History, Los Angeles, Politics, Video, Vietnam and tagged journalism, LA Times, peace march, police violence, polite riot, protest, riot, ruben salazar. Bookmark the permalink.